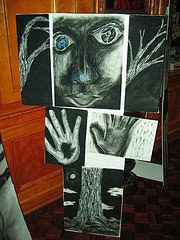 Maggie Davis' art class is currently displaying their imaginative and striking work in the CFL. Westminster students, parents, faculty and staff are invited to visit on Friday (11/7/08) to participate in a reception for the artists. Pictures of the work on display are available here. Maggie wrote the following on here new art blog concerning the project. "The 2D Design students spent the better part of October developing these larger than life imaginary characters. The idea to make such big figures evolved from the face project that Jen-Marie did with her junior high kids. I really admired the freshness of their drawings. She had them start with making a large black charcoal mark in the center of 18 x 24 paper, then she told them it was a nose and they had to create the face based on that mark. A very imaginative way to start a drawing (way to go Jen Marie). So I tried it with the 9th and 10th grade students and it was pretty amazing what they were doing. It was then I realized the drawings need to be attached to bodies and so the project evolved into something much bigger and more complicated than I imagined. To make these figures I had to get large sheets of foam core. The kids spray glued them to the foam core, then I cut the figures out and made stands for them so they would be free-standing. We put them in the high school library last week and will be having a reception for the kids on Friday (11/7/08). They are over-the-moon about their work and have been bringing their friends into the library to see their accomplishments." When I was four or five my mother took me to the head branch of my local library to register for a library card. The seemingly enormous confines of the library with all of its wondrous materials opened up a new world for me, a world I would have not experienced otherwise given my family's rather meager means. 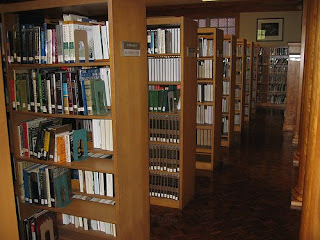 Visiting the library each week was a high point in my young life as I wandered the shelves finding new and fascinating books on so many things which interested me. I equally loved my school library and the wonderfully patient librarian who assisted me during class visits despite my constant need for materials beyond the scope of my reading abilities. My love affair with libraries grew into my present career as a librarian in a library truly beyond the scope of any high school library I have visited. Today I took a number of pictures capturing the beauty and breadth of the Carlyle Fraser Library to complement a number of links and books celebrating libraries and their aesthetic beauty. This post is for all the library fiends like myself who grew up in libraries and still find something amazing in both the mission and the beauty of a library. An inspirational collection of images featuring some of the most stately libraries from around the world. This is the source for beautiful library images. Anything and everything you ever wanted to know concerning the largest library in the world. A wonderful history of American libraries filled with pictures and broken into time periods to highlight the need and place of libraries in American culture. Examples of libraries and literature destroyed by intolerance and war. I recently discovered a very fun, free and quite easy to use program called Wordle for creating word clouds. After typing in or uploading text Wordle creates a word cloud giving prominence to words that appear most in the entry. Each word is represented once in the finished product. The fun part is changing colors, font, and layout to individualize your creation. Users can upload there finished creations for others to view, print, or save to their own sites. The uses for both personal enjoyment and class lessons are limitless. I really like this classroom lesson using Wordle to dissect meaning in current event articles. Wordle reminded me of a form of poetry I have loved since discovering the children's picture book A Poke In The I, concrete poetry. Concrete poetry, also known as pattern, shape, and visual poetry, places emphasis on the typographical structure of the written text to relate meaning even more so than the words contained in the poem. For example, a concrete poem relating the design and emotion of a sailboat will allow the words in the poem to outline and create the look of a boat. Anything and everything we see, feel, or imagine can be transformed into a shape constructed from words. The words we use to describe something become a picture in concrete poetry. For a formal definition visit Poets.org. Concrete poetry has roots in Greek lettering and the works of authors such as Ezra Pounds, E. E. Cummings, and Lewis Carroll's description of a mouse's tale in Alice In Wonderland. The medium's modern popularization and structure comes from Europe and South America, especially Brazil where a manifesto was written to encapsulate the meaning and direction of the art form. 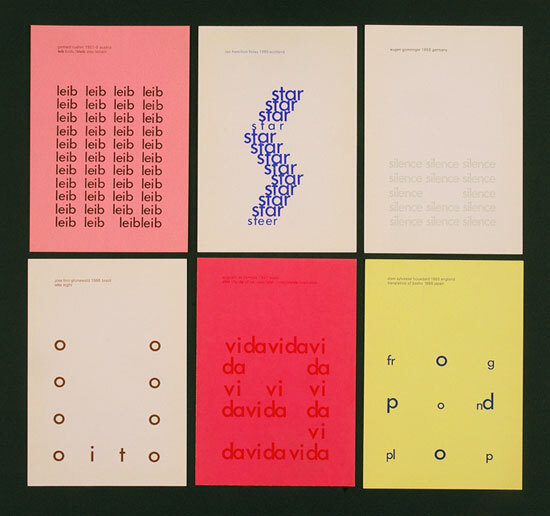 Many of the ideas and resulting images have found their way into graphic design, advertising, and art over the years resulting in a broader understanding of concrete poetry by adherents. If concrete poetry interests you follow some of the links below and look for books online and in larger library collections. ***The image above is from The Optimism of Modernity. The arrival of a new Neil Gaiman book is always a welcome treat for me since I love his writing so much. Gaiman consistently finds a perfect combination between the supernatural and the personal in his writings as he creates characters and settings identifiable to the reader despite situations we may never encounter ourselves. I am always in awe as I read his words, wondering how someone can be so eloquent and witty, so consistently. Thankfully, Gaiman just released a new book. 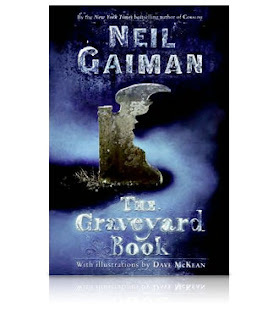 In a nutshell, Neil Gaiman's new book, The Graveyard Book, tells the story of Nobody Owens, a boy who lives in a graveyard filled with ghosts who guide him and a mentor stuck somewhere between worlds. Nobody, nicknamed Bod, has numerous encounters with supernatural forces in the graveyard while trying to steer clear of the being responsible for him family's death. Gaiman's new book is intended for middle school readers, but anyone who loves both his adult literature and his young adult titles will love the magic and beauty of his writing. His official young adult website features a video of him reading The Graveyard Book in its entirety. The video is a collection of individual readings he performed on his recent book tour to promote the new title. The man is just as gifted a speaker as a writer so take a look if you can. An amazing study of new culture versus old culture in the guise of Gods living among us. A real page turner examining the contradictions between who we are and who we want to be. An amazing graphic novel adaptation of the classic Joe Kubert comic book dealing with Gods on Earth. A wonderful and imaginative exploration of alternate worlds and realities. My favorite Neil Gaiman book! A man is sucked into a shadow world and must fight to save both himself and his new guide. With the presidential election in the United States quickly nearing an end I'm receiving more and more unsolicited emails from friends and family originating from dubious sources, if sourced at all. 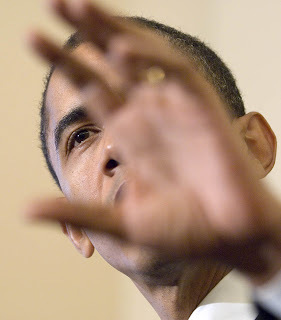 The emails started months ago with accusations calling Barack Obama a radical Muslim who was sworn in with a Koran after gaining a seat in the Senate. I've also received the obviously photoshopped photo of Sarah Palin in a bikini with a gun. Whenever I receive one of these unsourced and uninformed emails I politley send a rebuttal using one of two websites that reference credible sources to prove or disprove the accuracy of rumors - Snopes.com and Factcheck.org. Both sites have no party affiliation and cover a gamut of political material. Snopes also includes quite a few urban legends that should entertain for the sheer gulibility of some people concerning what they are willing to believe. So, the next time someone sends you a ridiculous email claiming their cell phone grew legs or Sarah Palin is secretly a modified pitbull created by Cheney, take a look at the sites above to see where the rumour originated and how to discredit the false information.